Company’s Here! Hellllloooo Stephanie Bryan! I’ve been so excited for some special company that’s been ‘planning a trip’ to the home of KBS. And this is the week of their long-awaited arrival. The first one we are greeting at the door? Wellllll…..
…let’s give a big hello to Stephanie Bryan! Here’s a gander at one of the beautiful pages she made using a KBS hand-written title. See what I mean about dreamy? How gorgeous is this page??? I love how Stephanie always has just the right touches for her pages. She does a lot of layering and it all comes together so beautifully! Die cut titles are my absolute favorite. 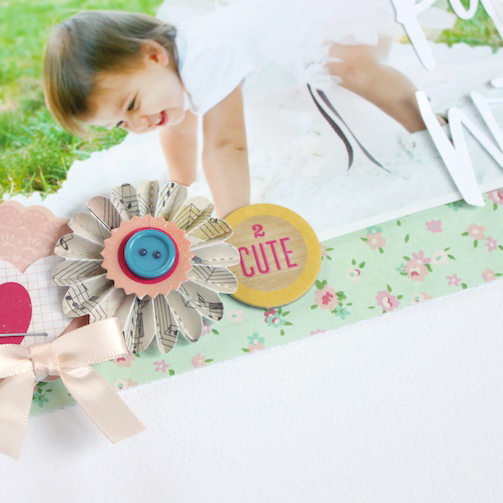 There is nothing better than a few pretty words to add the final touches to a layout. I always love to cut out my words and titles on white card stock. Once they are cut, I can decide if I want to use them as they are, paint them or even emboss them to add a pop of color. When I set my Silhouette up to cut, I usually add as many words or titles as I can onto one page and then cut them out to have on hand. I have a cute little basket in my craft room full of words just waiting to be used!! For this layout, I decided to use Kerri’s awesome titles as the main focus of my page. I cut it rather large so I could layer it next to my photos. I also decided to leave it as it was so the title would pop off of my patterned paper. You will also notice that I slightly overlapped my title/words with my photos. I find that this helps to ground my images to my page and draws your eye to both the title and photos. So thrilled to have you come visit at ‘my house’ Miss Stephanie! So beautiful!! it’s simple yet Oh so pretty! Great idea about just cutting a sheet of words/titles, to be used later. 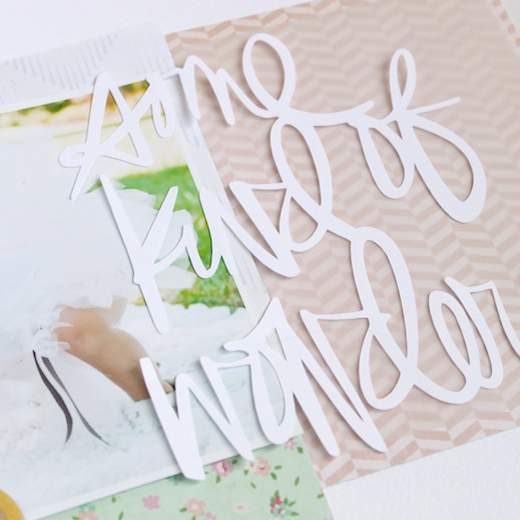 I also love the idea of die cutting in white and adding color other ways, more versatility. GREAT PAGE!! !